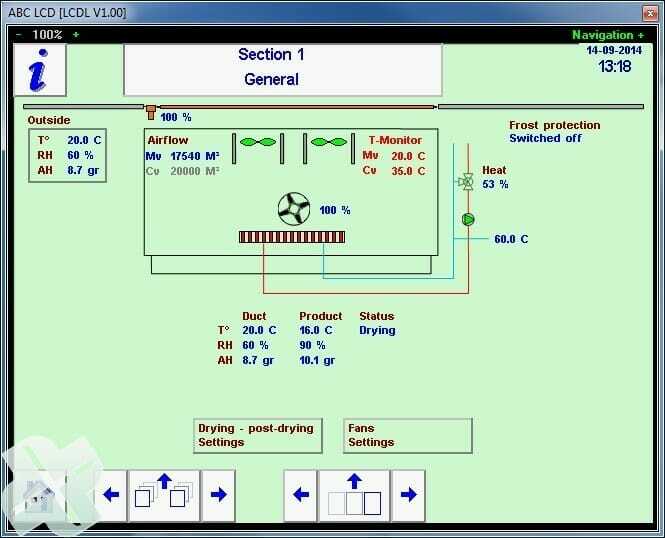 Touch screen with overview off a drying installation with 11 sections. Per section a square with basic information about the drying; T° and HR. 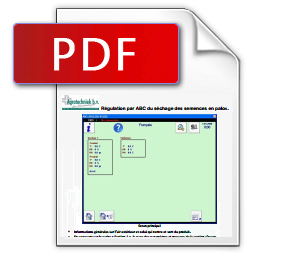 By clicking on one of the sections (squares), detailed information about the section appears. 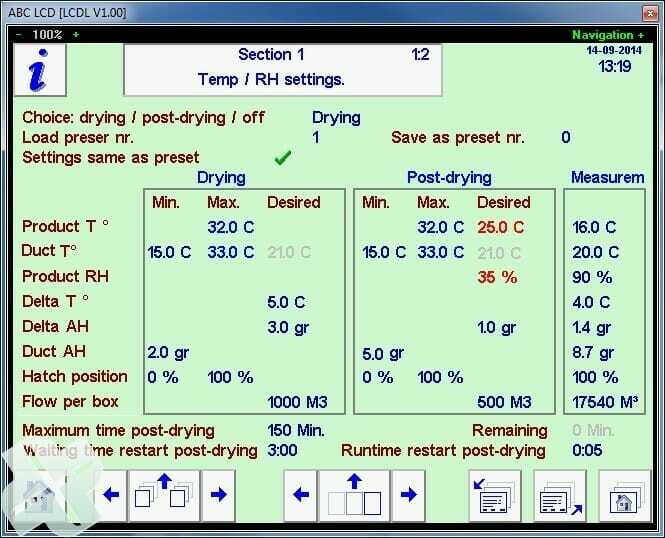 By clicking on `drying post-drying settings’ the setting-page for the section will open. 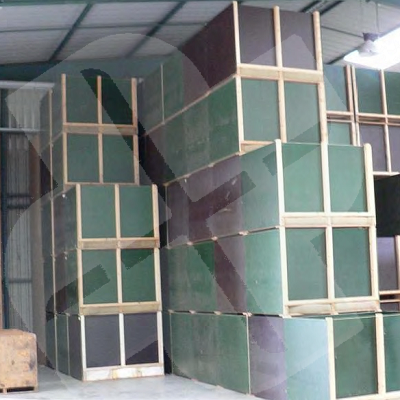 For the standard box drying installations, the drying is divided in 2 parts; Drying and Post-drying. The drying process consists of 2 stages: Drying and post-drying. The first process is ‘Drying’. Here with explanation of the different settings. Product T° 32.0 Setting of the maximum T° of air coming out of the product. If the measured maximum is exceeded, the heating valve will close and alarm will be given. For drying and post-drying. Min. Duct T° 15.0 Setting for the minimum T° of ingoing air during drying. If measured T° is getting below this value, the hatch be closed modulated, but never less than the minimum hatch setting. Max. Duct T° 33.0 Setting for the maximum T° of ingoing air during drying. If measured T° is getting above this value, the hatch be closed modulated, but never less than the minimum hatch setting. Desired Delta T 5.0 Adjustable T° difference between ingoing (duct) and outgoing (product) air. Desired Delta AH 3.0 Setting for the preferred difference in Absolute Humidity (AH) between ingoing (duct) and outgoing (product) air. Min. Duct AH 2.0 Setting of the minimum AH of ingoing air during drying. If the measured ingoing air is getting below this value, the hatch be closed modulated, but never less than the minimum hatch setting. Desired Flow per box 1000 Setting of the desired air volume in m³/h for this section during drying. Total airflow is air per box X number of boxes. 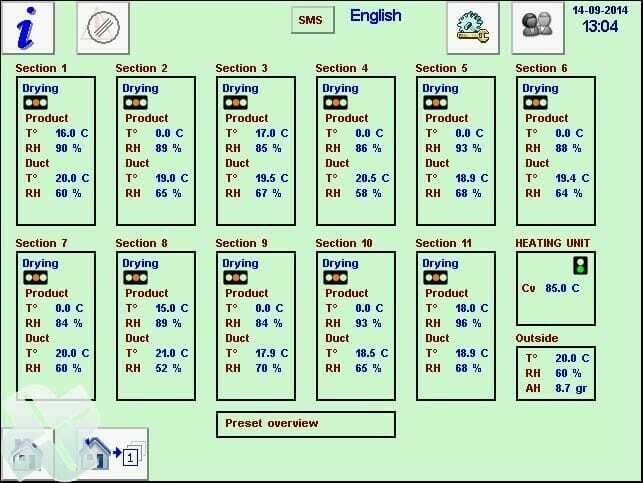 There are to options to switch from `Drying’ to Post-drying’`; When `Product HR’ has reached the desired level or when `Product Temperature +HR’ has reached the desired level. So ‘Drying’ will switch to ‘Post-drying’ when the ‘Desired Product RH’ or the ‘Desired Product RH’+‘Desired Product T°’ have been reached. During ‘post-drying’, the value at ‘Desired Product T°’ will be maintained. With an increasingly drier product the T° of the ingoing air will be almost equal to the ‘Desired Product T°’ because the air does not cool down as much. Furthermore, during ‘Post-drying’ the ‘Desired Delta AH’ and the ‘Min Duct AH’ are set. Desired final T° of outgoing air (and product) when drying has stopped. Desired Product RH 35 Desired HR of the air coming out of the seed when dry. “Fan on/off” Standard swiched `On’. Only for `Pause’ (check seed) set `Off’. 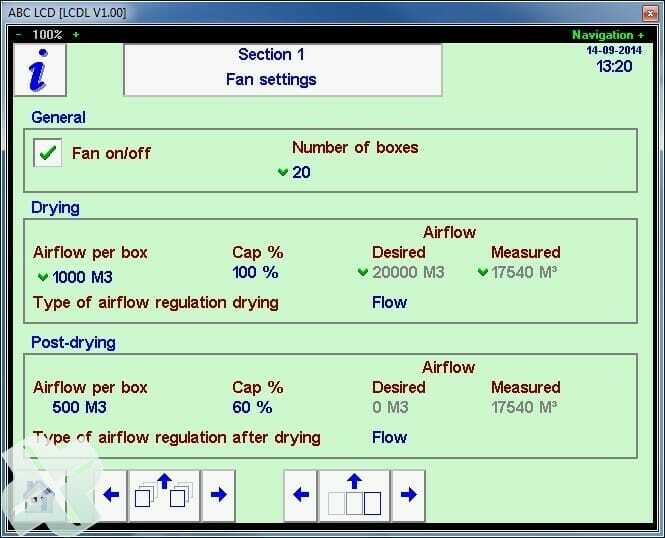 `Drying’ is active and `Flow’has been choosen; at airflow per box for drying. Measured 17540M3, but stearing to +/- 200M3 of desired airflow. With `airflow regulations’ on `flow’, the operator only set the number of boxes!